A little over a week ago, I visited Seattle for the first time. I was there to attend IFBC (International Food Bloggers Conference), but also to see this city that's been on my list of "must visit" places since I fell for a little band named Pearl Jam so many years ago. I packed a lot of good stuff into two and a half days. There's so much I want to share, but it takes me time to process and sort. I'll be dividing my experience up into bits and pieces and sharing them with you over the next few weeks (or so), starting today with an unassuming little root beer float. It was actually the burger that I was after. That morning, Bea and I had visited the Space Needle. Being the good friend that I am, I forced her to go to the top. She insisted that she'd rather just sit underneath, sipping from a bottle of something wrapped in a paper bag. She informed me that she did not like heights. So I informed her right back that I didn't either, but there was not a chance in hell that I was going to leave Seattle without viewing it from above—tourist trap or not (for the record, it's so much more than that). Let's just say she thanked me for being so...persistent. But I digress. The Space Needle is a story for another day. My point being that while we bought a ticket for it, we decided to take advantage of the discount you receive when buying a ticket to the Chihuley Garden and Glass at the same time. The plan was to come back once it started to get dark, though. So we hopped back on the Monorail after walking around the Pike Place Market district for a while on Saturday evening. Our plan was to check out the museum (not technically a museum, but that's what I'm calling it) and hightail it back to the hotel in plenty of time to spend time at the Taste of Seattle and Gourmet Fair that closed out that night of the conference. As I was instagramming some ethereal shots from Chihuley, I started to see pics posted from the conference in my feed. It had been a day jam-packed with activity and Pacific Northwest goodness, but darn it all if all I wanted at that point was to take a bite of the burger beckoning me from the screen. Fast-forward 45 minutes or so. We'd made our way back to the conference and were making our way around the expanse of a room—enjoying little nibbles of what the area had to offer. But I still hadn't laid eyes on that burger that shuttled my mind (and stomach) back to that spot before my body ever got there. As is usually my luck, I turned left when I should've turned right. I made my way through the entire cavernous room before spotting that burger. If I'd only turned right instead of left when I walked through the doors, it wouldn't been at the second or third table I encountered. But never mind, I'd found it. It sat there basking in the spotlight as I made a beeline past the mostly abandoned tables. The burger, actually a slider stacked sky-high and topped in a lacquered bun, was offered to me with a smile by an angel from Relish Burger Bistro (which is actually the restaurant that occupied the very hotel that held both my room and the conference, The Westin). Before I could leave, she asked if I'd also like a root beer float. Well, sure, I love root beer floats. They sat unassumingly on shelves of carved ice, in clear plastic cups. As she placed it in my hand, she told me that it was made with cardamom ice cream. 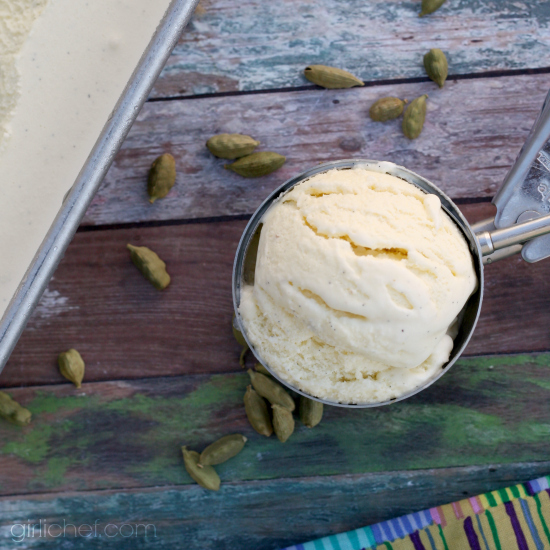 CARDAMOM ICE CREAM. Between biting into the juicy little burger and following it up with that creamy concoction, I was enjoying my best bite(s) of the day. I was in serious swoon mode as cut through the ice cream with my small wooden paddle. 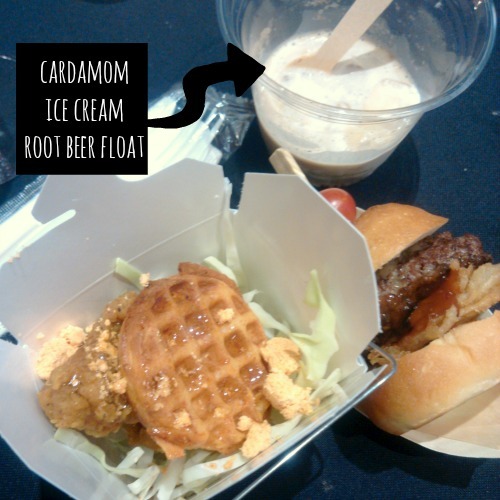 Creamy and laced with a sensuous tinge of cardamom, the ice cream settled comfortably into the cool, mild root beer. I tried offering some to Bea, but she insistently denied liking root beer. 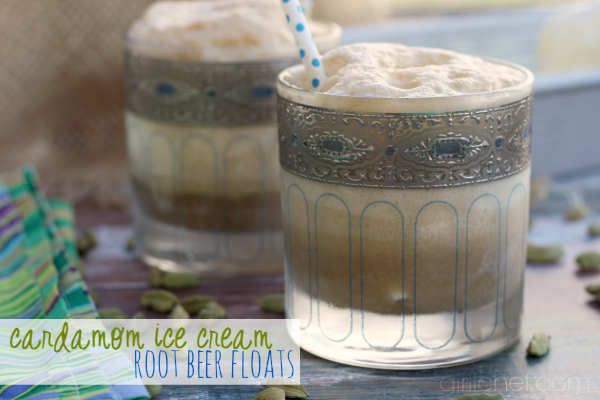 But it isn't just root beer, it's a root beer float with cardamom ice cream! An entirely different entity. Apparently a fear of heights is something I can convince her to forget, but an aversion to a delicious beverage is not. 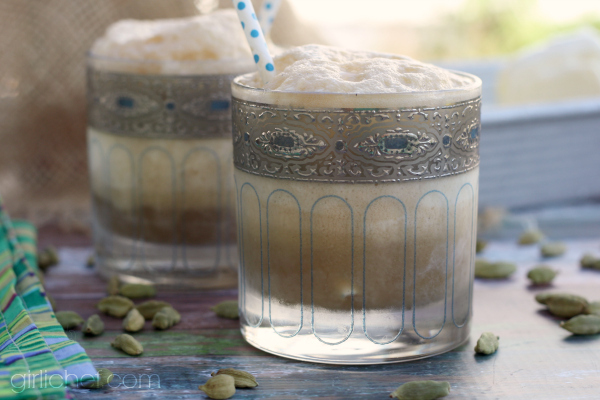 So yeah, I haven't been able to stop thinking about that root beer float with cardamom ice cream—so I decided to recreate it at home. Into the freezer went my slightly dented canister. Out came my stash of pale green cardamom pods and a plump Madagascar Bourbon Vanilla Bean that I brought home from the conference (courtesy of Rodelle). What resulted was a creamy frozen treat speckled with vanilla beans and scented with the perfect amount of exotic spice. A victory in itself. The true test was cracking open a bottle of root beer and watching it cascade over the waiting scoops. I slid my straw through the resulting foam, closed my eyes, and took a sip. Yes, the heavens opened and a choir of angels led by Eddie Vedder himself appeared. It was everything I remembered. And then some. Place the milk and cream in a medium-large heavy-bottomed pot. Scrape the seeds from the vanilla bean, then add those along with the pod to the pot; add crushed cardamom pods. Set over very low heat and bring to a boil, stirring from time to time. Once it boils for 30 seconds, turn off the heat and allow it to sit and infuse for 20 minutes. After 20 minutes, lift the vanilla bean and cardamom pods from the pot and discard (if any of the hard little black seeds have snuck out of the pod, be sure to strain it through a wire strainer - you don't want those getting into your ice cream); set back over very low heat. In the meantime, beat the egg yolks, sugar, and salt together until thick and pale. Carefully drizzle a bit of the hot milk mixture into the mixture, while beating, to temper. Then, all at once, pour the egg mixture into the pot, whisking quickly the whole time. Continue to cook, stirring constantly, until the custard is thick enough to coat the back of a spoon (napé). Do not let it come to a boil or you will get scrambled eggs instead of custard. Whisk in the ground cardamom. Prepare a large bowl of ice water. Open a gallon-sized zippered baggie and carefully pour the custard in. Seal, pushing out any air, and set it in the bowl of ice water. Squeeze the bag around inside of the ice water, this will quickly cool the custard. Once completely cool, pour into the frozen insert of an ice cream maker and churn according to manufacturer's instructions. Transfer to a freezer-safe container, cover, and freeze until needed. 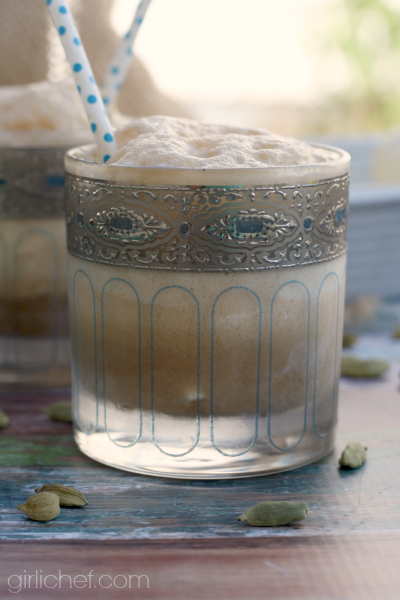 Eat as-is (yum), or scoop into a glass and then fill it with root beer for a stellar root beer float!